The remaining hive in my backyard went into the winter with lots of bees and honey stores. I haven’t worried about them too much during this cold spell because I took a quick peek a few weeks ago in the window and there were lots of bees inside. But that was before our extended cold streak, so it was good to see them flying and active over the past few days. There are quite a few dead ones which the undertaker bees have been dragging out continually for the past few days. They’ve accumulated quite a nice pile in front of the hive. I remember during my first year when I saw a smaller pile than this, I started freaking out. I realize now, it’s all just part of the process – the bees on the outside of the cluster die from the cold and then the undertaker bees carry them out the first chance they get. On Thursday, I got home early enough from work while it was still warm to take a closer peak at BnB2. I peeked in the window and again, there were plenty of bees inside. Since there are so many bees and it’s been so cold, I took the opportunity to open up the hive and make sure they still had enough honey to get them through the rest of the winter. There were still several bars of honey in the back and when I got up to about bar 8, I found some freshly capped brood and even some larva. (Since it was only in the upper 50’s, I didn’t want the brood to get chilled, so I didn’t take the time to take pictures.) But, it means the queen has been laying and there should be some new bees hatching soon. I suspect that there is even more brood closer to the front where there are more bees. One interesting thing is that the brood that I saw is on the west side of the hive which gets the late afternoon sun. That means it’s the warmest part of the hive late in the day. It also means that they’ve eaten a lot of the honey above the brood on that side and on the bar behind the brood area. So, I flipped the bar directly behind the last one with brood (which had open cells below and a honey band above) so there would be honey right next to the brood area. Since I didn’t delve too deeply into the brood area, I don’t know how the other bars look, but there if it’s anything like the ones I looked at, there is plenty of honey nearby, but maybe not close enough! 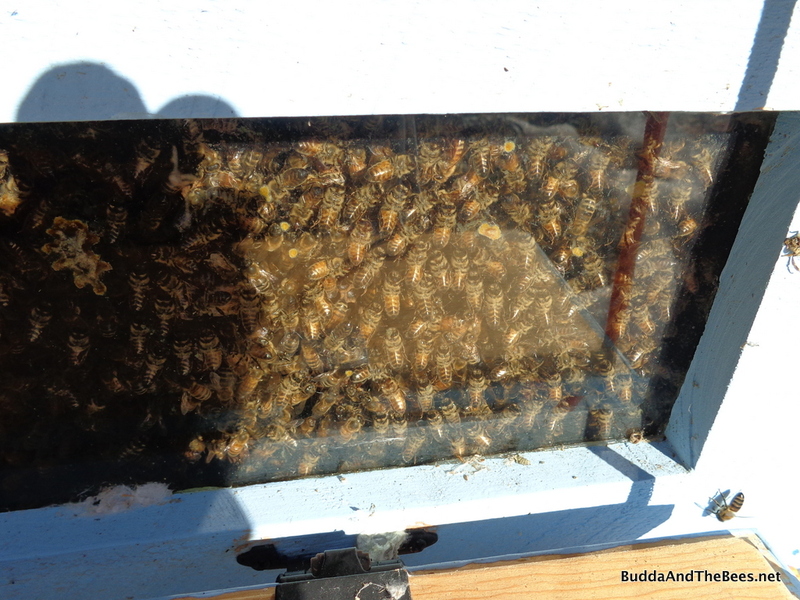 Duncan’s hive was not very strong going into the winter, but I hoped there were enough bees that they would make it. It started from a late split and never really built up numbers and honey. Unfortunately, the cold took it’s toll and that colony died. We took the opportunity of the warm day to look inside and see what happened. As we moved toward the front of the hive, we found a couple of bars with some dead bees, but most were at the bottom, dead. 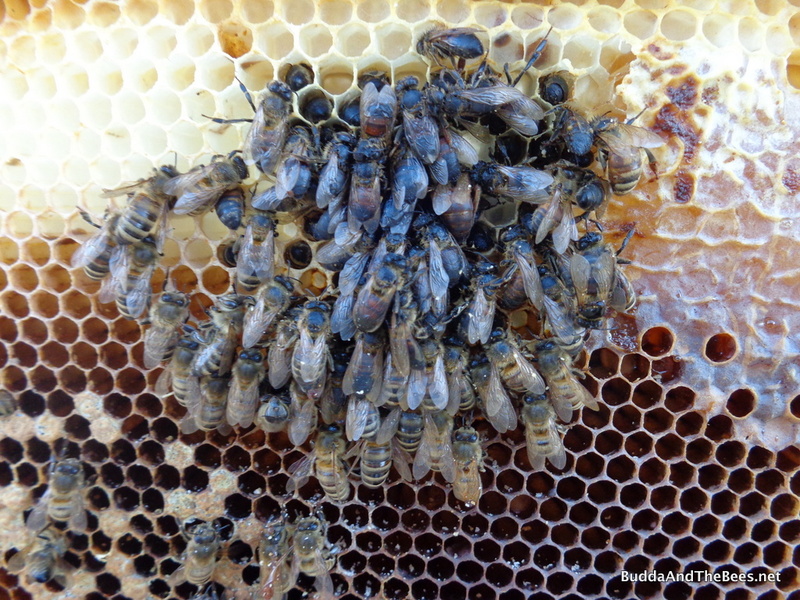 You can see some spotty capped brood cells below and some honey to the right of the dead cluster. They couldn’t move from the cluster to get to the honey since it was so cold. Below, you can see some of the bees with their butts sticking out of the cells where they were trying to get the last little bit of honey from the bottom of the cell. We cleaned out all the dead bees and the pile wasn’t half as big as the one in front of BnB2. There just weren’t enough bees for this hive to survive. We plugged up the one open entrance hole to keep the varmints out. It will stay cold enough for now so wax moths shouldn’t be a problem. I’ll build a little nucleus hive (a nuc) of the same dimensions that I can put the honey combs and some of the other newer combs in. Many of the combs in Hello Kitty came from BnB2 which is a different shape. Some of them are pretty dark (older combs), so I’ll harvest those. 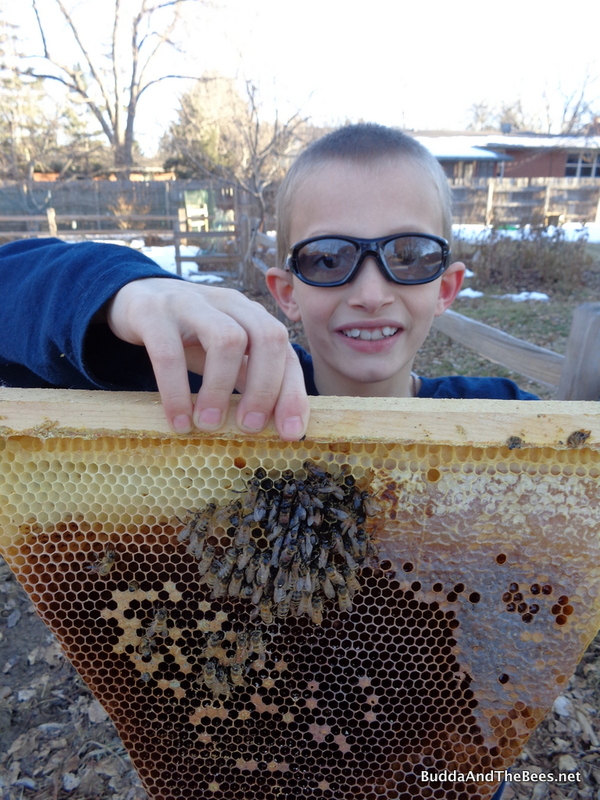 Duncan really wanted to take some of the honey, but I convinced him that we can leave it for the new bees we’ll buy in the spring. At least he got to poke his finger into some of the honey for a taste! I haven’t had a chance to look at Sarah’s hive in person, but during the last “warm” spell a couple of weeks ago, she reported that there were no bees flying. I probably should have checked today, but ran out of time and there was beer to be had (first time at Avery Brewing‘s new facility)! Sarah’s hive was really strong until late fall when it’s numbers dropped dramatically. She thought they were gone before the cold weather set in, but when I looked, there were still some in there, but not as many as I would have liked. In retrospect, I should have probably combined Hello Kitty and Sarah’s hive, but since they are a couple of miles apart and I have no nuc of that shape, it would have been problematic. So, I’m assuming that this hive is toast as well. I’ll go over to clean out the dead bees and plug up the entrance hole after the coming cold spell. This hive had lots of honey, so maybe a harvest of a couple of bars would be in order as well. It’s the time of year to order new bees. We have our first BCBA meeting of the year on Wednesday where I hope I can still put in an order. Most of the packages you can get around here (if not all) are from California. (This year, 3 lb packages are selling for about $120). I’m hoping that BnB2 makes it strongly through the winter, in which case, I’ll do a split into BnB1 so I won’t need new bees there. Duncan’s dad wants new bees, so I’ll get a package there. Sarah want bees again, so that’s 2 packages. Sarah has a big cottonwood tree in her yard with wild bees and last year they threw a swarm that landed on her back porch (I found out too late), but she’s not sure if they are still alive in the tree. If so, we could possibly catch a swarm from there and set up a new hive. A neighbor down the street has a empty Langstroth hive that she wants to switch out for a top bar hive (TBH). Someone offered me a free TBH (I have yet to collect), so I might take the Lang and give her the TBH and try my hand at that kind of beekeeping. I have someone who would like me to keep bees on their property (and I want to), so I might move the Lang down there. They had someone keeping bees there a couple of years ago and the old Lang hive is still on their property, but I can’t get the owner to sell me the equipment. So, I’ll start anew. My fabulous friend Lucia‘s Warre hive perished this winter and she has another empty hive, so that would be 2 more packages. I think I’ll order 5 and if I don’t need them all, I’m sure I can sell one or 2 since there are always people looking for packages when the deliveries occur in late April or May! If I do Langs, I might even consider a nuc which is a mini, already functioning colony. After almost hitting 60ºF today, it’s now (at 7pm MST) 33ºF and snowing. The girls in BnB2 were pretty active today. They were all over my compost pile, trying to find pollen to eat (but I think the best they could get would be a caffeine buzz off the coffee grounds). We could get over a foot of snow by Tuesday. Just another day in Colorado. The girls will have to hunker down for the next couple of weeks since it looks like we go back into the deep freeze. The group I work in is in the midst of a field campaign to study El Niño – flying planes and drones over the Pacific and probing the atmosphere with radiosondes (instrument packages that record the temperature, winds and humidity and are carried up by balloon or dropped out of the plane). I set up the forecasting resources website which we use to brief the field scientists. We are looking at how El Niño affects storms and how well models do at predicting weather in the tropical Pacific (among other things). 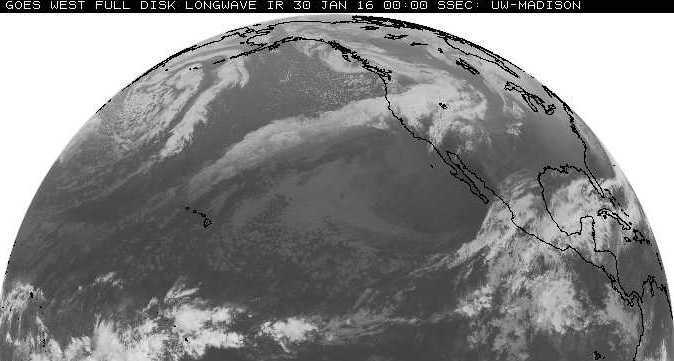 This first part of the coming storm came in over California dropping lots of rain on the snowpack in the Sierras, and originated in the central Pacific west of Hawaii. It’s impressive that this first snow has made it all the way inland on the strong westerly winds. A storm like this is not typical in an El Niño year, but this is not a typical El Niño. In a typical El Niño year, we get late season storms, so I expect that we’ll get some big dumps, right about the time that my packages are delivered. In my past 3 years of beekeeping, it’s always snowed right after the packages come in. I don’t expect this year will be any different, and it may be even snowier! I’m so sorry about BnB1 and Hello Kitty. Finger’s crossed for Sarah’s colony. BnB2 looks great, though. You could probably get more than one split if you wanted. Your expansion plans sound fantastic! Hope you can catch a swarm from Sarah’s cottonwood. That would be so cool! Looking for suitable outyards needs to be my next step, too. I will probably make at 6 splits this year. I’d like to keep 2 or 3, and I have people who’ve expressed interest in buying the others. However, I need to think about what I’ll do next year. It’s interesting that your bees are already brooding up. My colonies descended from Sam’s bees don’t start raising brood until the nectar flow starts, which was kind of shock for me at first. Now it’s normal and winter brood seems weird. Are your bees Italians? Mutts? You have some dark ones in there, so I was wondering. You are sooo lucky to get accurate long-range predictions of weather! I would love to know that stuff, but I have to be happy with just looking at signs. I think we’re might have an early spring, though. Although it’s way early, daffodils are already poking up in my garden, and snowdrops are already in bloom, I’ve heard. There’s still a lot of winter left, so I’ll have to see how well BnB2 comes through. It would be great to get more than one split, but even one would be great! It’s great that you have enough stock that you can consider selling some splits! The queen is an Italian/Carniolan hybrid and is probably more Italian since she’s a beautiful light color. The package bees were Italians when I first installed them and I love the golden color. But slowly the queen’s Carniolan traits came through and they darkened up. I do worry about them brooding up too much too early (that’s the Italian side I think). Thankfully, they have lots of honey stores, so should be okay even if spring is delayed. “Accurate” is a bit of an overstatement, but it is good to work with people who think about these things all the time. You’ll be getting a bit of winter in the next couple of weeks as the polar vortex returns to the East. I heard the cherry blossoms were in bloom in DC in December, but I’m sure the recent snowstorm put a damper on that! In general, El Nino means normal or above tempeartures for winter in NE though. to see what the statistics say about an early Spring!